Why use the miracle box? Birthing balls are hugely popular with pregnant women, but many of them just aren’t used to their full potential. Instead of actually exercising with the ball, too many women leave theirs waiting until they go into labor. In fact there are many advantages to inflating yours before you feel that first twinge – because these balls are one of the best things around for exercising during pregnancy, and also for getting your figure and strength back after the birth. Why are they so good? Because when you exercise on the ball, you have what we call an ‘unstable base’ – and it’s totally different to exercising on the floor or a bench, both of which are firm and stable. The instability of the ball makes your body, and your core muscles in particular, work harder to keep you balanced. In time these muscles will become stronger, resulting in fewer injuries and less back pain. Also, during pregnancy your centre of gravity is shifting on a daily basis so that improvement in balance becomes very important. 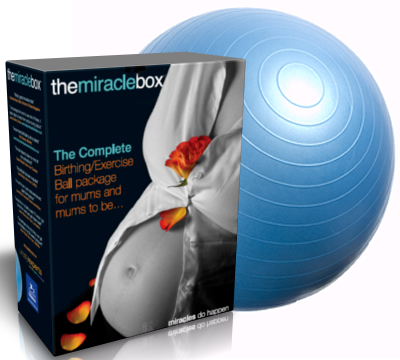 The Miracle Box for mums and mums to be give you all the know how on proper effective usage for exercising not just during pregnancy but also after to get your self back into shape. Give it a try now…..